Ever have pain in your belly, nausea, unexplained weight loss or severe dehydration? These are just a few of the symptoms that you shouldn’t ignore because they could be warning signs of chronic pancreatitis. The pancreas is a large gland tucked behind the stomach and the intestines that produces enzymes that help the body digest food and hormones that help the body regulate blood sugar. Chronic pancreatitis happens when the pancreas becomes inflamed and doesn’t work like it should anymore, even after treatment. Chronic pancreatitis can lead to serious, potentially life-threatening problems. That’s why knowing the symptoms and risk factors is so important, said Dr. Mitesh Patel, a gastroenterologist at MedStar Washington Hospital Center. The two most common causes of chronic pancreatitis are drinking too much alcohol and smoking cigarettes, Dr. Patel said. Alcohol is a toxin and that has the ability to damage cells and lead the pancreas to be scarred and inflamed over time. Smoking can have the similar effect on the pancreas, although researchers aren’t yet sure of the exact reason for smoking’s impact. “Years and years of this behavior can lead to inflammation of the pancreas,” Dr. Patel said. That inflammation can welcome a host of serious issues, including pancreatitis. Heredity can also play a role in a patient’s pancreatitis risk. Some people have genetic conditions that can lead to the development of pancreatitis, Dr. Patel said. “For that reason, some of these patients may fly under the radar,” he said, adding that it’s important for those patients to be mindful of common symptoms to prevent pancreatitis from progressing to a more serious condition. The most common symptom of pancreatitis is severe pain in the upper belly, which can spread through the body and into the back and radiate up to the shoulders. Nausea and vomiting are common symptoms as well because the pancreas’s inflammation tells the body it’s not ready to digest, “so anything you send it, we are going to send right back out,” Dr. Patel said. That can contribute to unintended weight loss and severe dehydration, he added. “Patients with acute pancreatitis need to be resuscitated with fluid at a relatively aggressive rate when they present at the emergency department. But if they don’t come to the emergency department, they risk the condition getting worse,” Dr. Patel said. Recurrent attacks of acute pancreatitis may eventually lead to chronic pancreatitis. Some symptoms caused by chronic pancreatitis are similar to those of other medical conditions. For example, cancer could be another common cause of unintended weight loss. That’s why testing can be so vital, Dr. Patel said. “It’s very important to come to a center that has expertise with excellent diagnostic testing available, great clinicians and the type of interventional procedures that might be needed to help deal with some of the chronic changes that come with pancreatitis,” he said. For those who get pancreatitis, doctors want to get to the root cause of why it has developed. One contributing factor could be what you’re eating. 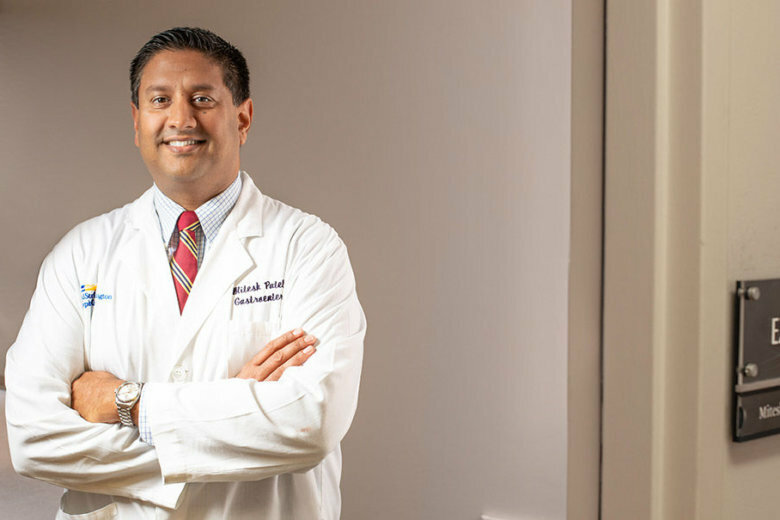 “We have an obesity epidemic in America and that’s very concerning because it could be leading to higher rates of gallstone disease,” which could mean pancreatitis, Dr. Patel said. “We can help screen some of these populations who get recurrent attacks, but when we find out that they have a genetic mutation, we don’t really have a solution for that. There’s no gene therapy at this time. And if we have this knowledge, maybe we can direct our patients to make healthier lifestyle choices. But we also risk causing undue anxiety in these patients,” he said. When someone gets pancreatitis, the gland is damaged and won’t go back to normal. Certain patients may want to look into a pancreas transplant. Others may need a procedure called autologous islet-cell transplant, which involves removing the pancreas and removing the cells that produce insulin and implanting them in the liver. There, the cells function normally and produce insulin as if they still were in the pancreas. Also, doctors can prescribe medication that can act almost like a replacement pancreas and help the body get the nutrients it needs from food. Ultimately, patients need to recognize the lifestyle changes that are needed to get and stay healthy. “Once you buy into the fact that this is how your body is now, we can work with you on educating you on what healthy lifestyles choices are, how to use your medicines, the appropriate timing to use medications, and following up with us and going through your regular checkups. That can get patients back on track for a healthier life,” Dr. Patel said. For more insights from Dr. Patel including his podcast on chronic pancreatitis, click here.